A protein-rich brunch is the perfect treat for after a long Sunday run. When Mum and I lived in Victoria, Canada, we took fantastic brunch for granted. We’d nip down to Lady Marmalade, Pagliacci’s or Rebar any time we fancied*. We didn’t know how spoiled we were! While there is some brunching in the UK, it’s not quite as exciting as Canadian elevenses. 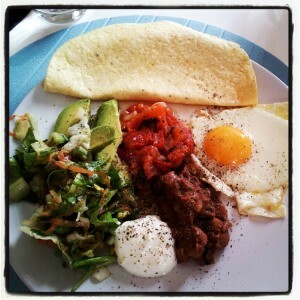 My favourite brunch taken from there has a distinctly Mexican twist, sure to wake you up first thing on a morning. Between the protein and good fats from the egg, avocado and refried beans, it’s pretty much the perfect post-race refueller. I didn’t run for a bus when I lived in Canada, but it’s definitely good to know now. We ate the one in the picture after a river path 10K one Sunday morning recently. It’s also very easily scale-uppable for having people over for. For that reason, I’ve given the quantities per person. It needs a lot of pans, however many people are eating, so you may as well invite some pals over for a weekend run and brunch. *Since we moved away, the fantastic Discovery Coffee in James Bay has started serving gorgeous brunch too. Pity we’re 5000 miles away, but at least we can visit now and again. What’s your favourite weekend brunch dish for friends? Optional, in the picture – last night’s leftover salad. In separate pans, put your refried beans and salsa over very low heat to warm up. Heat a little flavourless oil in a frying pan and fry your eggs. I like to put a tight-fitting lid over mine to help cook the top of the white before the yolk is cooked through. In a dry frying pan, fry your tortillas one at a time and wrap in a (clean!) tea towel until you’re ready to use them. Serve the eggs, salsa, beans and tortillas garnished with the avocado, sour cream and coriander.